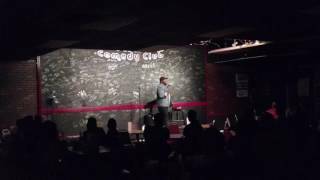 Rob Ward is a stand up comedian from the inner city of Cleveland, Ohio. Throughout most of grade school he was considered a class clown. He later began his comedy in early 2009 when a childhood friend asked him to perform at a local open mic. Rob instantly fell in love and was obsessed with making crowds laugh. Rob since has become one of the most booked comics in the area. Joining Benji Brown on his national “Pull up and Laff tour”. Rob will also be making his television debut early this year, on Comedy Central presents Kevin Hart’s “Hart of the City”. He has also proving himself by winning over tough crowds such as winning the world famous “Showtime at the Apollo” in Harlem New York. Rob has a unique style and credits his big smile for letting him get away with almost any subject matter. Nevertheless, Rob uses comedy as his vehicle to give his prospective on life as a father, his family, and marriage.